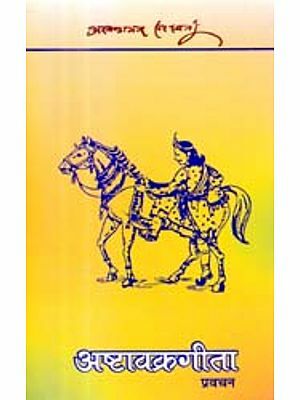 Ashtavakra Gita is a very valuable work containing the highest Advaitic teaching imparted by Sage Ashtavakra to King Janaka, by means of a conversation. Being a ripe soul King Janaka became Self-realised by following the teaching of Ashtavakra. An edition (with limited circulation) carrying the Kannada transliteration of Ashtavakra Gita along with the English translation of Swamy Nityaswarupananda of Ramakrishna Mission was published by the Mysore. Palace. A copy was presented to Sri Bhagavan by the Maharaja of Mysore in 1932. The speciality of the copy presented to Sri Bhagavan is that he (Bhagavan) has copied the original Sanskrit text in his own hand in the free space above the Kanada version. Sri Bhagavan ha also written the caption 'Maharaja of Mysore' below the picture of the Maharaja. 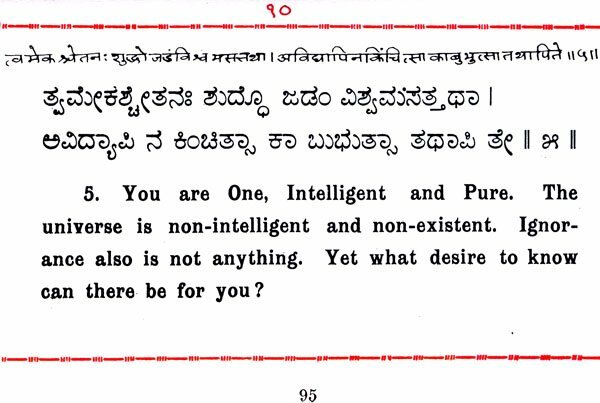 This has been carefully preserved at the Ashram Archives. The Ashtavakra Gita was always commended by Sri Bhagavan for study by seekers. For this reason as well as the weightier one that the book carries the personal touch of Sri Bhagavan a facsimile is brought out as a special edition by the Ashram on this sacred day, the 121st Jayanti of Sri Bhagavan.